Java provides a new feature called method reference in Java 8. Method reference is used to refer method of functional interface. It is compact and easy form of lambda expression. Each time when you are using lambda expression to just referring a method, you can replace your lambda expression with method reference. 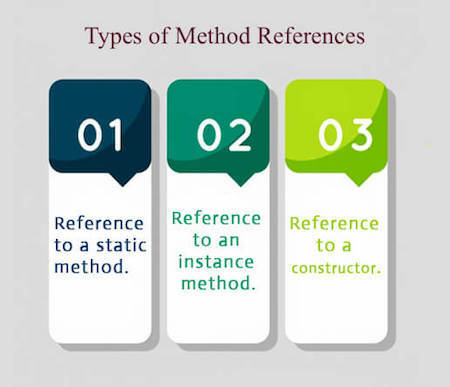 In this tutorial, we are explaining method reference concept in detail. Reference to a static method. Reference to an instance method. In the following example, we have defined a functional interface and referring a static method to it's functional method say(). Hello, this is static method. In the following example, we are using predefined functional interface Runnable to refer static method. You can also use predefined functional interface to refer methods. In the following example, we are using BiFunction interface and using it's apply() method. You can also override static methods by referring methods. In the following example, we have defined and overloaded three add methods. In the following example, we are referring non-static methods. You can refer methods by class object and anonymous object. Hello, this is non-static method. In the following example, we are referring instance (non-static) method. Runnable interface contains only one abstract method. So, we can use it as functional interface. In the following example, we are using BiFunction interface. It is a predefined interface and contains a functional method apply(). Here, we are referring add method to apply method. You can refer a constructor by using the new keyword. Here, we are referring constructor with the help of functional interface.